Removes Organic Pollutants, Discoloration and Odors in Ponds and Water Gardens. Activated Coal-Based Carbon Provides Optimal Pore Structure for Fast Absorption of Contaminants. 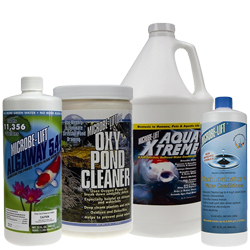 MICROBE-LIFT®/ACTIVATED CARBON maximizes the removal of contaminants, helping to keep water clean and clear. MICROBE-LIFT®/ACTIVATED CARBON is a coal-based carbon for use in decorative ponds and water gardens. Fast-acting and highly-activated, it can be used in all types of filters to aggressively eliminate: odors, discoloration caused by tannins from decayed leaves (tea colored water), organic debris pollutants, pesticides, detergents and toxins, as well as medications, without releasing phosphates or causing unwanted growth. Activated carbon attracts pollutants which "stick" to it like a magnet. Carbon cannot be reactivated like zeolite. Activated carbon can remove some chlorine and chloramines from city tap water. The amount of removal is based on the amount of chlorine/chloramines in the water and the amount of carbon used. Keep out of reach of children. Avoid contact with eyes. If contact occurs, flush eyes thoroughly with cold water. Place desired amount of MICROBE-LIFT®/ACTIVATED CARBON into a media bag. Rinse in cold running water as carbon is characteristically dusty. Position the media bag for maximum water flow through the carbon. It is recommended that you test your water weekly. Use MICROBE-LIFT® TEST STRIPS. MICROBE-LIFT/Dry Ammonia Remover uses a patented process that removes chlorine, destroys chloramines and completely eliminates the ammonia that is left behind when the chloramine bond is broken.